Spring has us here at AB Tasty feeling invigorated. Our latest product update, which launches today, brings several new features that mark a significant development in our Product Roadmap toward automated testing and personalization. We’ve been doing some spring cleaning, too, as you’ll find several features in the platform working more quickly and smoothly thanks to infrastructural updates. Read on to learn what’s blooming this season at AB Tasty. 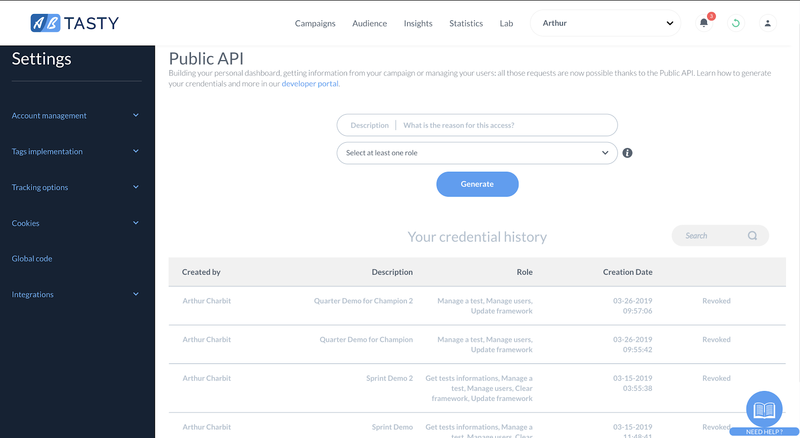 Our latest update to Audience Builder focuses on extending your targeting criteria into the realm of revenue. Building on Audience Builder, we've added new criteria like Last Purchase, Purchase Frequency and Payment Type to target specific buyer personas based on actual transaction data. Targeting based on data layer variables is easier than ever– just connect your tag management platform to access. Create audiences based on criteria like product category (or anything else, really), and access your data with autocomplete for data layer keys. After Social Proof released earlier this year, our second dynamic widget is Image Matchmaker. Rather than set up multiple A/B tests, our Image Matchmaker widget dynamically selects the best-converting image from a list you provide. Yes– you're glimpsing the future of automated testing and optimization. If the shoe fits, they say. Image Matchmaker can test which product images fit a particular audience, so you can save your best-converting personas –via Audience Builder– and let this dynamic widget do the rest. Manage any part of your A/B testing outside of the AB Tasty platform. Want to manage your campaigns in house? Our Public API allows you to build an intranet-based personal interface of your own, while retaining all the core technology of A/B Tasty. Update and clear the AB Tasty script to stay in full control of your website. Audience Builder, for saving custom audiences to use in campaigns, will be rolled out to all accounts over the next 6 weeks. Want to join the beta for our new Reports section? Just ask your Customer Success Manager. Server-side Reports have been migrated to using our new Universal Collect for faster performance. We've also added Transactions to these reports. We're rolling out a major update to Session Recording in mid-April which will fix performance issues that some accounts have been experiencing.